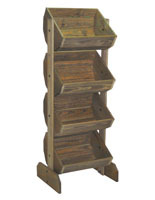 Add some rustic charm to your store with this wood display stand, a great floor standing option made with a sturdy pine frame. 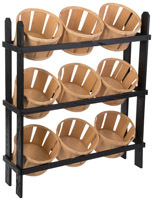 Perfect for holding vegetables, bread, trinkets, and a variety of other products, the 3 bins are angled for optimal viewing to entice customers. 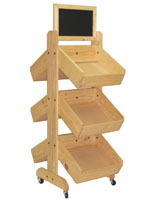 Made for a variety of retail stores, this oak stain display stand can be utilized as a clearance rack for impulse purchases or as a produce bin, letting you adapt this unit to your shop’s needs. Each 7” deep compartment on this beautifully designed fixture can hold a large quantity of products, helping you showcase more items in less space. Place this single-sided unit for the floor against a wall or counter in high traffic areas of your store to entice customers while they shop. The large chalkboard header offers you the option to write custom messages to advertise items, promote sales, or show prices. 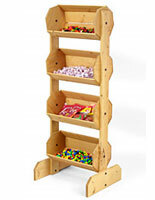 This display stand is beautifully designed to give you store a more natural feel. Please Note: The bins are not sanded and may be rough to the touch. 27.0" x 67.0" x 16.0"
15.0" x 23.0" x 7.0"
I bought this product to use for a retail display and I love it. 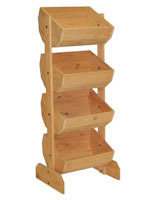 It is very sturdy and well put together. It looks great in our store. The only thing is that it is bigger than I expected (my fault for not checking measurements), and the bins are deeper than I expected. Otherwise - I think its great. This product is not worth it!! It takes over a month to ship, (cannot understand that one! ), and is roughewn and unsanded with splinters coming out of it!! Looks like it was made from pallet scraps, would not recommend it! We are very sorry to hear that you were not happy with your recent experience with us, Doug. Someone from our customer care department will reach out to address your issue as soon as possible.